Hi everyone! Just wanted to share a quick card with you. Haven't had much time to craft this week, I'm still organizing everything in my new room. I love being in here though. My design computer, the PC, is still without Internet. We are waiting for the people to come and repair the line for Internet in the bedroom. Hope to have it up and running tomorrow so I can get working on my design orders. It's also my crazy time at work, always at the beginning of the month so I have been super busy there too. So much on my to do list, I hope to get some caught up this weekend. 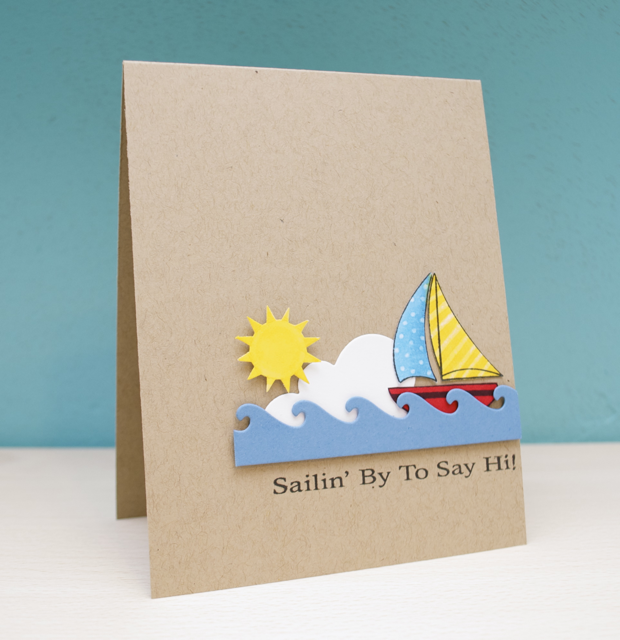 So for my card I wanted to share, I did this quick card using Nautical from my friend Kim's stamps, Wilson Designs. When I went up to her house to visit her I stole this set (lol jk). Isn't it a cute set? If you haven't checked it out, be sure to HERE. I colored the sailboat with Copics and then used my colorless blender to make the polka dots and stripes. I also used the wave and cloud die from My Favorite Things. Well im off to bed! Im beat! This card is soooooo ADORABLE! Love it! very cute, and I love how you used markers to make patterned paper. I need to treat myself to some Wilson stamps real soon, they're so cute. What a cute CAS card Jenny. so effective. Such a cheerful card...Love it! Such a CUTE card Jenny! Adorable, Jenny! Love all that "white" space and the fun dots and stripes on the sail! I love it! So CAS!! What a great CAS card! So adorable! You just can't get any cuter than this, ok, well I know all your designs are super cute!! :) Wish you a Happy Mother's Day, Jenny! LOVE this card Jenny!!! Adorable! This is fabulous Jenny! Should be published in a magazine! What a cute layout! Your cards are always so fabulous! Oh, I love everything about this card. Great sentiment. Always love coming by to see you. Hi Jenny!!! I LOVE your cloud placement and this is such a great great CAS card! Love that wave die....I think it needs to come to my house! LOL But what is that sun? Is that a die or punch? I like that too! Thanks for linking this up at OTWC! I'm glad Kim let you play with this set! So lovin' your card dearie!!! Thanks for using your Wilson Designs stamps and playing at OTWC!!!!! !